Sydney Royal is the brand name for the competitive events that the Royal Agricultural Society of NSW organises every year. As well as the animals and agricultural produce that form one of the much-loved centrepieces of the Sydney Royal Easter Show, these competitions include an enormous array of human skills, talents and accomplishments. They are designed to select, reward and applaud the tastiest honeys, the best showjumpers, the finest alpacas, the most skilled woodchoppers, the ultimate rural achiever, the most accomplished cake decorators, the finest wines, cheeses, coffees and olive oils and the best looking ute. Crown State is excited to be receiving a silver medal for taste test in the Domestic class and a bronze medal in the Export class. We look forward to entering again in 2017 and we await the results. A big thank you to Michael Rapley and Micky Rapley and their families. Our remoteness provides natural protection from diseases and our wide open spaces have allowed us to achieve sustainable production. Our cattle live a stress-free life delivering a better result for everyone. For us it starts with great produce, available in abundance, but it’s the shared enjoyment that makes it so much better. Australia produces a rich diversity of product, perfectly suited to different occasions when red meat is enjoyed. People around the world can taste an Australian way of life when they enjoy Aussie beef. In April 2015, CSP chose to enter the 2015 Sydney Royal Beef Challenge competition. This competition requires vendors to put together a pen of 6 head of cattle to be feed at Wilga Feedlot. CSP drafted up 6 head of company bred Angus steers to be entered into the domestic class of the competition. This year’s competition had a total of 450 head of cattle entered. Out of this some 330 head were entered into the domestic class alone. The competition looked at a number of characteristics of feedlot cattle. These included live assessment which assessed feedlot growth and performance, the feedlot total which scored carcass grid compliance, carcass judge scores, a meat quality score based on MSA index, and profitability. The competition awarded points to pens of 6 as well as individual animals. CSP were the proud winners of two ribbons: First place for an individual animal in the carcass grid section and a Third placing for individual animal for feedlot performance. 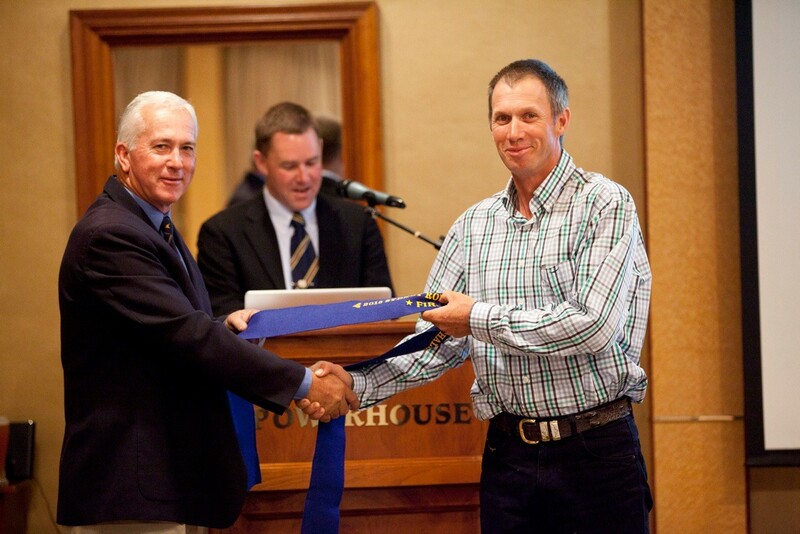 Mobla Farm Manager, Michael Rapley, accepting our First Prize award for the Royal Agricultural Society of NSW Beef Challenge!